Slick Suit Singh — Future Prime Minister of Canada? Every social movement has its heroes. Within the spectrum of Canadian political correctness, this role is currently fulfilled by Liberal Prime Minister Justin Trudeau. His incessant promotion of all-things multicultural — in particular a fervent dedication to our Islamic and LGBT communities — has advanced a globalist agenda to the extent that to even question its motives draws the wrath of social justice warriors from coast to coast. Yet, being a most insatiable collective of hyper-aggressive globalists, this social dynamic is incomplete. What is required, of course, is a leader to emerge from one of Canada’s coveted Third World communities. This is not Justin Trudeau, but it is NDP leadership candidate Jagmeet Singh. 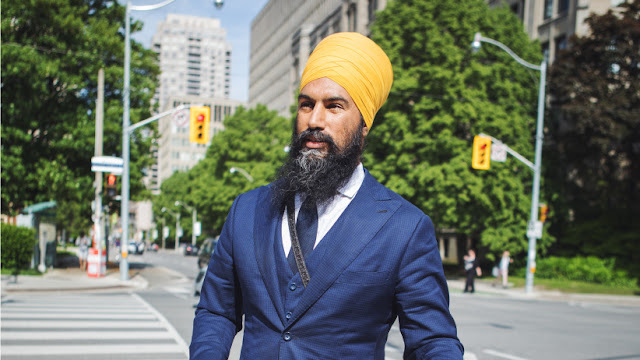 Clad in slick suits and designer turbans, Mr. Singh recently became official poster-boy for Canada’s diversity industry. It is indeed a privileged position, as the standards held for “traditional” Canadian politicians do not apply to “multicultural” politicians such as Mr. Singh. Recently, a protestor interrupted an NDP event in Brampton, Ontario. A woman got onstage and began to aggressively question Mr. Singh regarding his position on issues relating to Islam, and Sharia law in particular. Granted, the approach was ill-advised, as the spontaneity of her inquiry was not a proper platform in which to address sensitive issues of this nature. Within a democratic political environment, however, a candidate running for office is required to address the concerns of their constituents. Jagmeet Singh did nothing of the sort. Rather, he waxed philosophical regarding the need for all Canadians to “love each other.” A noble thought, yet one which entirely evades the issues. Recently, Mr. Singh released a public statement that he opposes a motion put forth by the provincial government of Quebec requiring public servants to reveal their face when administering services to clients. After months of inquiry, our protestor wanted answers — yet none ever arrived. The result of her interruption of the meeting was universal condemnation. Media attacked her. Liberal politicians vilified her. All of a sudden, Singh was catapulted to a position not unlike that of globalist messiah. He had single-handedly defeated the bad, bad racist. Victory was assured, and Mr. Singh was declared a hero. Canadian “identity” politics have changed the nature of political discourse in Canada, and not for the better. Time was when the main issue within politics were issues — for example addressing public concern, as well as one’s duty to constituents. Times have changed. Today, after a forty year program of diversity indoctrination, the main issue is the identity of a politician. Within contemporary society, Third World political figures are depicted as vital and brimming with benevolence. Conversely, Anglo-Canadians politicians — save Justin Trudeau — are old and tired. At present they are something of a political dinosaur. On the other hand, Singh and others like him are rendered untouchable. If one dares speak against them, prepare to be branded a racist. What privilege! Protected by a teflon-coating of political correctness, identity politicians are accountable to no one but their own particular community. As for the Anglophone minority in Mr. Singh’s riding of Brampton, Ontario — a riding where over 90% of constituents are of Third World origin — these people have no choice but to grin and bear it. Any dissent amongst the ranks will bring the inevitable accusations of bigotry, and the rest. Talk about being placed in social straight jacket. Since gaining office, Justin Trudeau has been a pin-up poster boy of culture-eroding globalism. Naturally, this is not good enough. For Canada’s diversity-bandits, nothing ever is. What is required is the real deal. A non-Anglophone, Third World Canadian leader of the variety we find in Jagmeet Singh — the NDP’s answer to their political failings of the past decade. Arecent payout of $10.5 million dollars to convicted terrorist Omar Khadr represents a watershed moment in the history of political correctness in Canada. 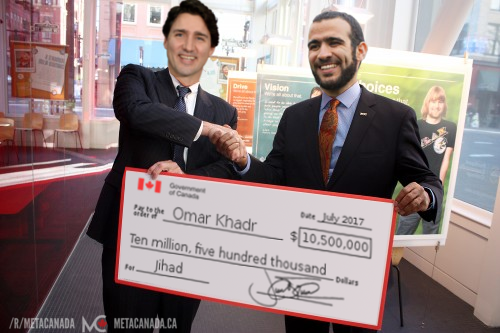 As endorsed by Prime Minister Justin Trudeau, Mr. Khadr has hit the jackpot and can now settle into a life of luxury upon Canadian soil. Not bad for a terrorist convicted of murder. While there isn’t a politician past or present who has disgraced our country with the vigour of Justin Trudeau, the road to the loss of our national dignity did not originate with our current prime minister. This we can attribute to the founder of Canada’s collective self- loathing — his father. Pierre Trudeau is the most misunderstood figure in Canadian history. A maverick political figure from day one, Trudeau Sr. thumbed his nose at western institutions of his day while embracing socialist ideology discovered during his travels as a student in Asia. Some where between the opium smoking and the communist manifesto, Pierre discovered his true ideological calling — as an irreverent intellectual with a pre-disposition toward his political nemesis — British colonialism, and the institutions created in its image. From his first term as prime minister in 1968 to his final curtain call in the early 1980’s, Pierre worked to erode Canada’s connection to Britain and the Commonwealth. For the purpose of empowering minority communities — as well as the legal industry who support them — Trudeau introduced the Charter of Rights and Freedoms. In an effort to advance the rights of special interest groups, Trudeau created the Court Challenges Program, enabling these entities to take legal action based upon perceived social injustices. The outcome was a fundamental transformation within society. Power and influence shifted away from the Canadian majority and into the hands of tax-payer funded interest groups, multicultural organizations, human rights tribunals and other leftist institutions. Thus, a new Canada was born —though it would take decades for the general public to understand exactly what had occurred. It is arguable most still do not comprehend the full picture. To understand the roots of the re-imagining of our nation, we look to the fateful day in 1971 when Pierre Trudeau introduced multiculturalism to Canada. Without any form of mandate or approval from the Canadian people, Pierre Trudeau cancelled our bi-cultural English and French Canadian identity and replaced it with multicultural policy. Few at the time were aware of the pending side effects—namely, that multiculturalism would not be inclusive of Anglophone or Francophone identity. Indeed, it was and remains the exclusive domain of migrants from Asia and the Middle East. As decades passed and Third World immigration began to alter our demographic make-up, a powerful diversity industry came into existence. This collective of immigration pundits, academics and media — as well as government itself — began to alter our national destiny. By way of an accusation of historical racism toward Third World and First Nations communities, our diversity warriors were able to convince the Canadian majority to question, and ultimately dislike, the heritage of their own nation. At present, we see this manifested in Prime Minister Trudeau’s litany of apologies to our LGBT, Chinese, Muslim and Sikh communities. Never mind the fact that Italian, German and Ukrainian- Canadians were sent by the thousands to internment camps under the War Measures Act. Racism in Canada is an exclusive of the Third World, and these forces intend to keep it that way. Waving a collective finger at the descendants of the founders of our nation, we are informed by politically-oriented new arrivals that Canada is built on “stolen land,” and if we don’t cooperate — or perhaps even if we do — they will work to steal it back. Naturally, Justin Trudeau is all-in on this campaign. Raised within an environment of malevolence toward English Canada, as well as within ear shot of father Pierre’s admiration for communism, Justin is the perfect pitch-man for what he refers to as a “post-modern” Canada — which really means a Canada devoid of Anglophone identity. Canada has seen its share of the Trudeau family’s disdain for both democratic process and the will of the majority. Multiculturalism, which became official policy in 1988, was a unilateral decision on the part of government — if not on the part of Pierre himself. Both father and son share an affinity for believing their personal will equates with public will — a personality trait bordering on the delusional. Pierre Trudeau began Canada’s long day’s journey into cultural demise, but it is son Justin who will finish off Anglo-Canada for good. By way of mass immigration — another nation-changing policy devoid of public input — Justin is leading us down a path toward a complete societal inversion. By way of measures such as “Islamophobia” motion M103, our so-called minorities are today the preferred communities of choice, while “Old Stock” Canadians are rendered perfunctory at best. “Out with the old, in with the new” appears to be the maxim of PM Trudeau and his sunny gang of cultural eradicators. If and when Canadian-born citizens wake up to the fact that an injustice of grand design is at the heart of the Trudeau agenda, perhaps the dignity lost in a whirlwind of diversity and political correctness can then be returned to the descendants of those who built our country. Our society is suffering from an alarming disconnect: minority groups in Canada and the U.S. are sharing their experiences of being targeted or intimidated by bigots, yet their testimonies in news reports are drawing the ire of critics. How on earth did we get here? ​Brad: The first point we have to understand is the source of the “disconnect.” It is not rooted in the intrinsic ​nature of the people of Canada. Rather, it is the result of the disconnect between government and its citizens. It is essential to understand that mass immigration and multiculturalism are both unilateral government policies, meaning the general public never had a say regarding the demographic and cultural transformation in the first place. ​This is the root of the issue. So if blame or responsibility is going to be assigned, it should be assigned toward government…and in particular, what has emerged as the “Trudeau Dynasty” in the form of predecessor Pierre and son Justin, who chose of their own volition to implement nation-changing government policy WITHOUT THE CONSENT OR APPROVAL OF THE CANADIAN PEOPLE. ​Brad: Yes, Canadians are sick of the multicult jive and political correct​ness. While incidents of racial prejudice on our streets should not be tolerated, it is a situation which develops out of frustration and resentment. Blaming Canadians of European heritage will resolve NOTHING. It will only increase anger and resentment. If there is to be resolution in this matter, it must be as a result of a combined effort– immigration community adaption being a primary component. The road to resolution is not a one-way street. So, rather than play the blame game in perpetuity, these communities should gain a deeper understanding of the reasons why resentment against globalism is rising rapidly. It’s not Trump specifically. The anger has been building for decades. Minorities, by nature, are sensitive about being exploited, standing out or being excluded. Brad: And “non-minorities” are the same. Canadian-born citizens don’t appreciate being ignored by government, having their nation turned upside down by way of unilateral government policy, and having their thoughts and feelings shut down by endless accusations of racism. We don’t like being excluded either– for example, by way of Chinese-only public signage in Richmond BC. Here in Canada, Conservative leadership contender Kellie Leitch captured headlines by stoking fears about improper screening of immigrants. ​Brad: Kellie Leitch captures headlines by exercising her constitutional right to freedom of assembly and expression. Such is Canada’s long history of democratic tradition…however, these leftist types seem to believe these rights are to be the exclusive domain of globalists, diversity-pushers and multicult proponents. Check the Charter of Rights and Freedoms. I assure these civil rights apply to ALL Canadians, and not just our third world communities. We in Canada should heed these signs. Ideologies that incite hate crimes easily transcend borders, especially when they’re laid out online or given free air time by the news media. ​Brad: Please…Canada’s mainstream media have been left-leaning for decades. For the most part, they have been complicit in protecting Justin Trudeau’s agenda for the re-imagining of our nation as little more than an international hotel for the very poor and the very rich. It is only in past few months that a tangible change in approach has occurred. Minority groups are absolutely justified in feeling that their safety is being threatened. Brad: All people’s safety is being threatened, and in all objectivity, much of this is rooted in extremist and militant Islamic terror. Brad: Isn’t it rather interesting that the Liberal-Islamic Party of Canada have never actually told the Canadian public WHY they are so hell-bent– despite the fact that polls indicate Canadians are opposed to the initiative– on importing Islam and the refugees into our country?